Few treatment options and those too having side effects prompted the discovery of platelet-rich plasma (PRP) which has shown remarkable beneficial effects without any major adverse reactions. PRP represents an autologous concentration of human platelets in a small volume of plasma having 4-7 times the platelet concentration above the normal blood [Table 1]. It is injected subcutaneously into the area of alopecia. The basic idea behind PRP injection is to deliver high concentrations of growth factors to the scalp, with the hope of stimulating hair regrowth. After taking clearance from the hospital ethical committee, the study was started. In our study, 8 young male and 2 female patients suffering with alopecia in the age group of 25-35 years were selected. After taking adequate consent, they were given PRP therapy over a period of 3 months and their condition was assessed at regular intervals. 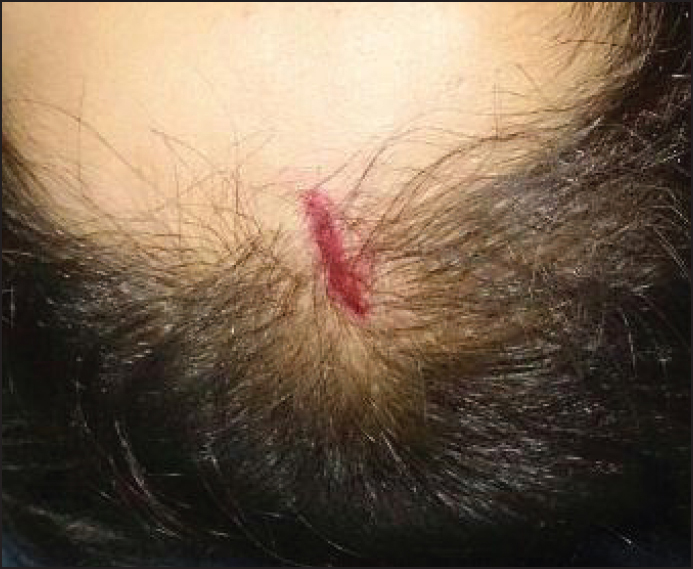 The scalps were examined to exclude any inflammation, erythema or scarring. Furthermore, a control group of 8 males and 2 females in the same age group were given the medical treatment but no PRP. All patients were advised to avoid washing hair 2 days prior to the treatment. The "hair pull test" is performed 3 times by the same clinician wherein a bundle of approximately 50-60 hair is grasped between the thumb, index, and middle finger from the base close to the scalp. The hair is firmly tugged away from the scalp, and the extracted hair is counted in every session. To evaluate overall hair growth, hair volume, hair quality, and fullness, global pictures are taken in every session from the front, vertex, lateral, and back view. All patients were advised to avoid any hair products and medicines. Twenty milliliter of fresh blood is collected from the median cubital vein into sodium citrate vacutainers under aseptic condition. The tubes are rotated in a centrifuge machine at 1500 revolutions per minute for 6 min. The first centrifugation called "soft spin" separates the blood into three layers, lowermost RBC layer (55% of total volume), topmost acellular plasma layer called platelet poor plasma (PPP, 40% of total volume), and an intermediate PRP layer (5% of total volume) called the "buffy coat." Buffy coat with PPP is collected with the help of Finn pipette in another test tube. This tube is again centrifuged at 2500 revolution per minute for 15 min called "hard spin." This allows the platelets (PRP) to settle at the bottom of the tube. The upper layer containing PPP is discarded and the lower layer of PRP is collected in another clean tube. The platelet concentrate is loaded in 1 mL insulin syringes containing calcium chloride (9 parts of PRP and 1 part calcium chloride) as an activator and made ready for injections into the regions of interest. The above process is carried out under Laminar Air Flow Hood to maintain sterility and asepsis. Two days prior to the treatment, the patients are advised to wash hair with their regular shampoo followed by disinfecting with chlorhexidine. Area of the scalp is cleansed with spirit and povidone-iodine. With the help of insulin syringe PRP is injected over affected area by nappage technique (multiple small injections in a linear pattern 1-cm apart) under proper aseptic precaution in the minor operation theatre. A total volume of 8-12 cc is injected. The treatment is repeated every 2 weeks for four sessions. All the patients are evaluated at 1-week intervals. Hair growth was seen in six patients after 7 days and in four patients after 15 days. By the end of 3 months, all ten patients had good hair growth [Figure 1], [Figure 2], [Figure 3], [Figure 4]. 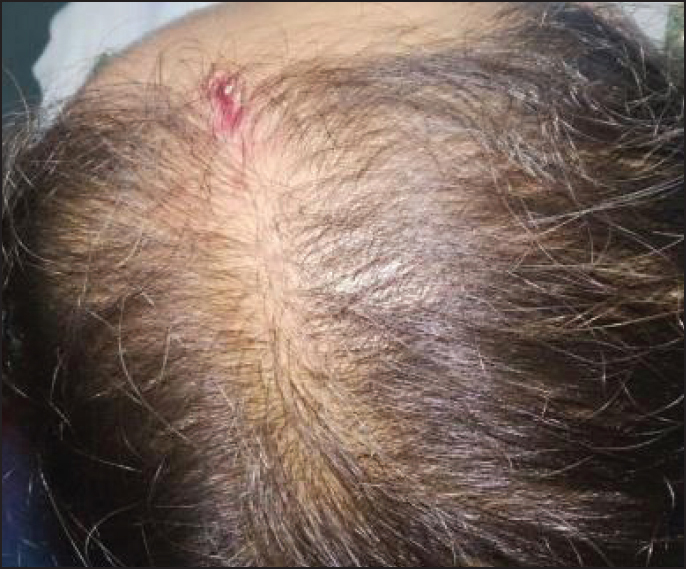 Three patients complained of a mild headache after the initial procedure which was alleviated after paracetamol 500 mg. None of the patients had any inflammation or infection. The results of the hair pull test are illustrated in the table showing that the number of hair pulled out has reduced by an average of 65% [Table 1]. The controls showed no improvement in the hair pull test. No new hair growth was seen in the controls. While the genetic involvement is pronounced but poorly understood, major advances have been achieved in understanding principal elements of the androgen metabolism involved: Androgen-dependent processes are predominantly due to the binding of DHT to the AR. DHT-dependent cell functions depend on the availability of weak androgens, their conversion to more potent androgens via the action of five alpha-reductase, low enzymatic activity of androgen inactivating enzymes, and functionally active AR present in high numbers. The predisposed scalp exhibits high levels of DHT and increased expression of the AR. Conversion of testosterone to DHT within the dermal papilla plays a central role, while androgen-regulated factors deriving from dermal papilla cells are believed to influence the growth of other components of the hair follicle. Current available treatment modalities with proven efficacy are oral finasteride, a competitive inhibitor of type 2 five alpha-reductase, and topical minoxidil, an adenosine-triphosphate-sensitive potassium channel opener which has been reported to stimulate the production of vascular endothelial growth factor (VEGF) in cultured dermal papilla cells. Since the clinical success rate of treatment of AGA with modulators of androgen metabolism or hair growth promoters is limited, sustained microscopic follicular inflammation with connective tissue remodeling, eventually resulting in permanent hair loss, is considered a possible cofactor in the complex etiology of AGA. Hair follicle has a very complex biologic structure and growth of the hair process is regulated by specific growth cycles. The mature follicle undergoes a successive transformation from anagen (active hair shaft production) to catagen (apoptosis-driven regression) to telogen (resting phase with the involution of hair follicle). , Role of apoptosis (by the pathway of caspases cascade) in determining the passage from anagen to catagen is well known. Many growth factors play a fundamental role in the life-long cyclic transformation of the hair follicle functioning as biologic switches that are turned on and off during the different phases, controlling the active phase and promoting apoptosis to induce catagen and telogen. , The main growth factors involved in the establishment of hair follicle are VEGF, epidermal growth factor (EGF), insulin 1-like growth factor, and fibroblast growth factor. Platelets release large amounts of platelet-derived growth factor (PDGFaa, PDGFbb, and PDGFab), transforming growth factor beta β1 and β2, EGF, and VEGF , [Table 2]. The beneficial effects of PRP in AGA can thus be attributed to various PDGFs causing improvement in the function of hair follicle and promotion of hair growth. It is safe, cheap, and nonallergic, and it appears to be a useful adjuvant in the management of AGA. The ever increasing literature has also seen modifications of PRP to increase its therapeutic results. Takikawa et al.,  investigated a low-molecular-weight heparin, as a carrier for PRP. Dalteparin/protamine (DP), in water soluble microparticles, acts as a biomaterial to adsorb, stabilize, and gradually release the GFs in PRP, as almost all of them are known to be heparin binding. 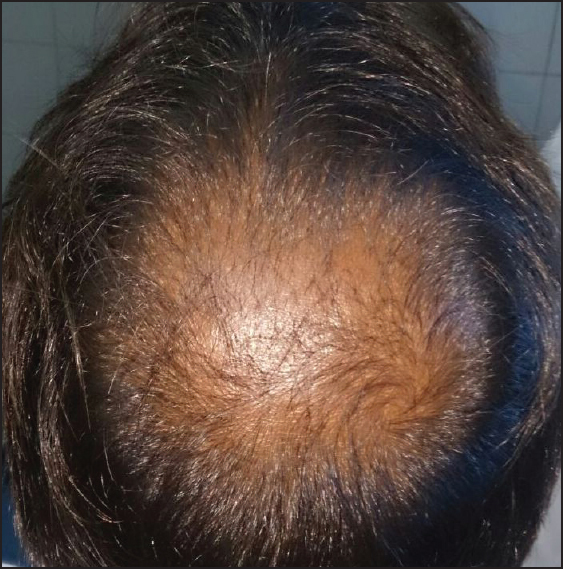 Results showed that DP in PRP could further improve the hair thickness as compared to PRP alone without any side effects, although the effect of DP alone was not assessed as control. 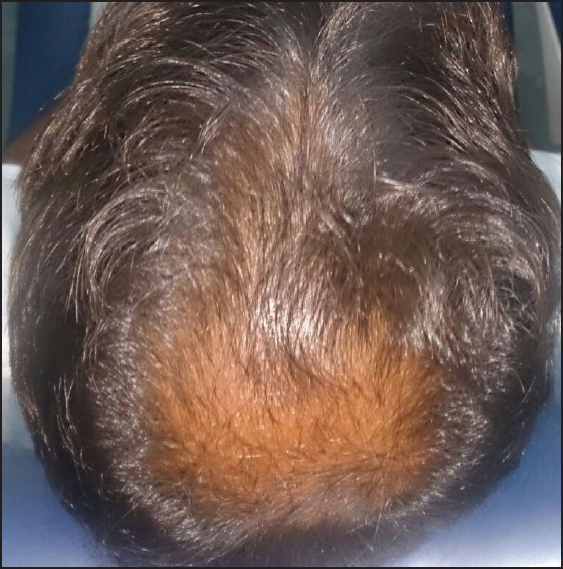 Platelet-rich plasma injection for androgenic alopecia is a simple, cost-effective and feasible treatment option for hair loss and can be regarded as a valuable adjuvant treatment modality for androgenic alopecia. Although PRP has a sufficient theoretical scientific basis to support its use in hair restoration, hair restoration using PRP is still at its infancy. Clinical evidence is still weak. Considering its excellent safety profile and relatively low cost, PRP hair treatment is a promising treatment option for patients with thinning hair. This study was done in collaboration with the Dermatology Department. The market survey revealed that the cost of hair transplantation ranged from INR 60,000 to INR 3 lakhs. However, Only INR 4000 per patient is charged in our hospital making it very economical and cost-effective. Although experience and anecdotal clinical data are important, we still need randomized, placebo-controlled, clinical trials to be certain that PRP does, in fact, induce hair growth. Trink A, Sorbellini E, Bezzola P, Rodella L, Rezzani R, Ramot Y, et al. A randomized, double-blind, placebo- and active-controlled, half-head study to evaluate the effects of platelet-rich plasma on alopecia areata. Br J Dermatol 2013;169:690-4. Rallis E, Falidas E, Villias C. Amyopathic dermatomyositis-associated bilateral elbow ulcers successfully treated with autologous platelet-rich plasma. Int J Dermatol 2014;53:e50-2. Kang BK, Lee JH, Shin MK, Kim NI. Infraorbital rejuvenation using PRP (platelet-rich plasma): A prospective, randomized, split-face trial. J Am Acad Dermatol 2013;68:SAB24. Park KY, Kim IS, Kim BJ, Kim MN. Letter: Autologous fat grafting and platelet-rich plasma for treatment of facial contour defects. Dermatol Surg 2012;38:1572-4. Rinaldi F, Sorbellini E, Coscera T. The role of platelet rich plasma to control anagen phase: Evaluation in vitro and in vivo in hair transplant and hair treatment. Int J Trichol 2011;3:S14-5. Giusti I, Rughetti A, D′Ascenzo S, Millimaggi D, Pavan A, Dell′Orso L, et al. Identification of an optimal concentration of platelet gel for promoting angiogenesis in human endothelial cells. Transfusion 2009;49:771-8. Cho JW, Kim SA, Lee KS. Platelet-rich plasma induces increased expression of G1 cell cycle regulators, type I collagen, and matrix metalloproteinase-1 in human skin fibroblasts. Int J Mol Med 2012;29:32-6. Kurita M, Aiba-Kojima E, Shigeura T, Matsumoto D, Suga H, Inoue K, et al. Differential effects of three preparations of human serum on expansion of various types of human cells. Plast Reconstr Surg 2008;122:438-48. Krasna M, Domanovic D, Tomsic A, Svajger U, Jeras M. Platelet gel stimulates proliferation of human dermal fibroblasts in vitro. Acta Dermatovenerol Alp Pannonica Adriat 2007;16:105-10. Megumi Takikawa, Shinichiro Nakamura, Shingo Nakamura. Enhanced effect of Platelet-rich plasma containing a new carrier on hair growth. Dermatol Surg 2011;37:1721-9.